The Elisa Lanera Foundation (ELF) was formed with knowledge acquired after traveling to Africa and noticing that the root cause of most of the social issues affecting their communities was due to a lack of education. Our purpose is to provide scholastic education to children, vocational training to adults and HIV/AIDS awareness to all persons in the poor communities of Africa impacted by a lack of educational resources. The Elisa Lanera Foundation will establish its groundwork in Cape Town and Johannesburg, South Africa through implementing extensive educational curriculums that will allow children to recognize their future opportunities, strengths and potentials. Our programs will also spread awareness of the current HIV/AIDS epidemic corrupting the communities and offer preventative methods. In the distant future, ELF expects to launch its programs throughout various countries with the hopes of spreading globally over the next twenty plus years. The glowing spirit on the faces of the children in the poor communities in Africa reflects innocence and their belief that anything is possible. They demonstrate a remarkable eagerness to learn and to them, the greatest gift of all is the gift of hope. 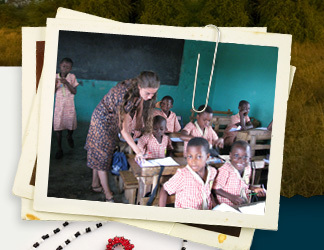 Elisa Lanera Foundation is dedicated to promoting hope and providing schooling and HIV/AIDS awareness to African communities who anticipate a better life through education. ELF recently dedicated its efforts to building a Library/Learning Center at Kiddy Kare Nursery and Preparatory School in Abokobi-Accra, Ghana, with the future aspirations of building schools and creating curricula in the poor townships of South Africa. These children are too young and too far away to ask for themselves. On behalf of the ELF Staff, Board of Directors, and the communities we serve, we are pleased to have you join us on our journey to continue changing the lives and instilling a future of hope for those in need.